The TRUMPF N 700-2 nibbler. WEIGHING only 8.3kg, the new TRUMPF N 700-2 nibbler, available from Headland Machinery , is the lightweight of its class. This weight reduction is made possible by a new planetary gear, which achieves an even distribution of power and a more compact design. Equipped with a 1600 watt motor with starting current limiter, this power tool easily nibbles 7mm-thick steel and 5mm-thick stainless steel. Even workpieces with up to 90° chamfering and double-strength sheets present no problem. The nibbler comes with two standard-model handles that can be quickly exchanged. The user is able to get the best possible grip on the machine without worrying about fatigue, regardless of whether the job involves horizontal or vertical cutting or machining narrow, hard-to-reach spots. A rotary motor handle with three positions affords the user even more clearance. The N 700-2 is ideal for use in tank and container construction (recycling) or in dismantling nuclear power plants. As a result of its optimal profile mobility and easy guidance, it can also be used for a wide range of applications such as coil machining, sheet metal projects, metal structures and elevator construction, commercial vehicle engineering and shipbuilding, as well as workshop repairs. The mounting for the die base has been optimised with an additional integrated centreing ring. But this model also features two unique innovations: the base is exchangeable and can be set for four possible cutting directions, in both cases without the use of additional tools. Additional adjustments to the punch and die are unnecessary. The user has a choice of three different dies for various levels of sheet thickness, strength and grade. 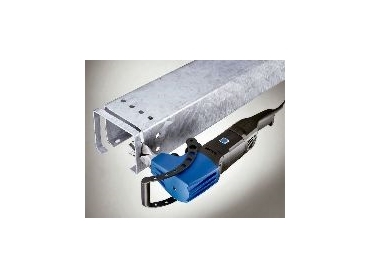 For working with structural steel and high-strength sheet metal, the Nibbler's punch can be reground by up to a total of 10mm. This significantly extends its service life. The N 700-2's optimised peen improves the radius mobility. A swarf inhibitor improves the cutting performance: it eliminates non-cutting strokes and minimises the amount of marks on the underside of the sheet. The tool can be easily backed out of the cutting slot. Due to its guidance, N 700-2 operates with almost no vibrations. This reduces the impact on the nibbler and allows the user to work under more manageable conditions.